Personal Training - The Perfect Supplement For Your Physical Therapy Degree! Weight loss and fitness degrees and certifications are becoming more and more popular. Unfortunately, the line between them and physical therapy can become blury. Certified personal trainers (CPT's) can now specialize in rehab which can move some trainers dangerously close to (trying) practicing physical therapy without a degree. Not that physical therapists are threatened. No, but we do value our degrees, value our code of ethics, and we will protect our patients by educating them about the differences between PT's (physical therapists and CPT's. A wider knowledge base - you will learn things you never learned in PT school. Income security - physical therapists are renting space in fitness gyms and putting their shingle out. Home care patients may not qualify for home care PT but may pay for a personal trainer to help them get stronger. Added value to your customers whether patients or clients. Physical therapists carrry degrees, meaning 4-6 years of schooling (and many today graduting with doctorate degrees). Insurance does not usually pay for a CPT although there are the few out there who have begun to pay for lifestyle improvement and wellness programs. Insurance is more likely to pay for physical therapy with a doctors order stating necessity and PT notes clearly stating medical need and ongoing progress. CPT's, with minimal training must remain vigilant and listen to clients complaints of pain and know every clients medical history. Physical therapists have less freedom to treat patients in that if the patient does not have appropriate referrals (except in free access states) from their doctor, the PT can not treat them. But the PT does not have to worry about charging the patient. Office staff take care of insurance billing while PT's simply take home a pay check. More and more physical therapists and personal trainers are treating patients and clients in their homes on a cash only basis. Again, don't count on this in our current economy. More and more physical therapists and personal trainers are treating patients and clients in their homes on a cash only basis. Again, don't count on this in our current economy. Get your Physical Therapy degree first - then supplement it with a CPT certification or degree. I found the physical therapy requirements to blend in nicely with the requirements for a CPT certification! The two areas of knowledge marry nicely. And they have paid off nicely in knowledge, expertise and the wallet. My first pick is always ACSM (American College of Sports Medicine). The benchmark of all personal training certs! You can't go wrong. Grueling training requirements (and my final test on September 11, 2001! - failed along with the rest of my class). Re-tested later and passed with 100%! You can get super guidance pursuing personal training certification or degree at this highly respected and resourceful website called starting your own personal training business. Later I took the home study course through ISSA (International Sports Science Association). It was good but a heavy focus on strength training with not much emphasis or respect for cardio vascular training. Suggested time to finish is 6 months, depending on life. You can't go wrong with getting some CPT certs as well. BUT, the physical therapy requirements for your degree should come FIRST! In this economy, personal training becomes an "extra" that people are wiping from their budgets. Focus on your physical therapy degree - there are tons of physical therapy career options and something that people can get help with through insurance, your career choice stands solid. Don't be fooled, however, the economy is also hitting the medical fields as people are deciding against elective surgeries which brings the bottom dollar line down in hospitals nationwide. There are no guaranatees for any career anymore. After obtaining your PT degree, get the extra's on the side. Remember that your physical therapy degree takes far longer (3-5 years) to accomplish than does a 6 months home study course for personal training or a weekend certification. Your pay and your career security will likely reflect that. Build your foundation with a solid degree... then pile on the extra's. Learn and grow as you go... it's really fun that way! Full Time? Part Time or PRN? What's Best? 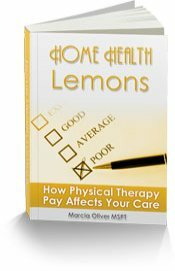 Is Your Home Health Physical Therapy Job Secure? Tell Your Patients To Brag About You! Don't Be A PT Lemon!